As photographers, we are passionate about sharing our vision of the vertical world and the people who frequent it. Our goal is not to just show you what it looks like up there but, hopefully, to provide an inkling of what it feels like to be in these extraordinary places. When it all goes right and the light rises to the occasion, these remarkable places can briefly and magically come to life, revealing a striking beauty. Being there, in those moments, is why we photograph. 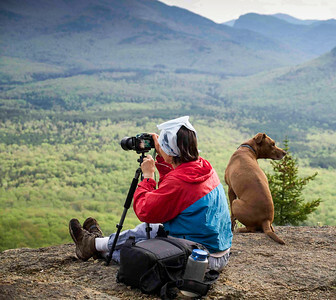 We offer a diverse suite of photographic services, primarily focused on mountain and adventure photography. Suspended hundreds of feet above the ground on a remote cliff or waiting for perfect light next to a trailside waterfall, photographers R.L. and Karen Stolz are comfortable creating images in nearly any mountain environment, in any season. Rock and ice climbing, mountaineering, and other adventure sports form the nucleus of our image gathering but we are similarly captivated by majestic mountain landscapes and abstract interpretations of form and light. 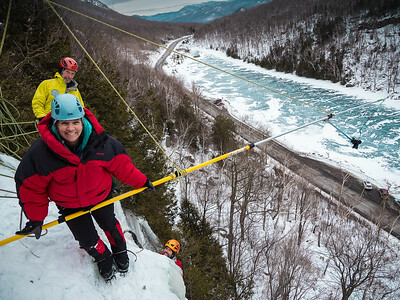 As career mountain guides and founders of Alpine Adventures, Inc. based in Keene, NY since 1985, we (R.L. and Karen Stolz) have devoted our lives to sharing the vast array of inspiring and compelling experiences mountain adventures engender. Along the way, we have each accumulated more than thirty years experience guiding rock climbing, ice climbing, mountaineering and backcountry skiing. 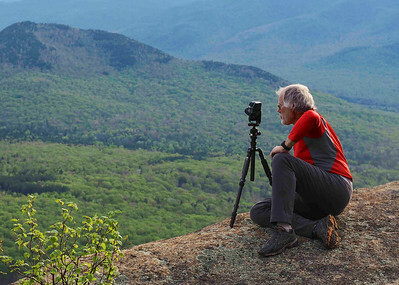 Throughout the Adirondack Mountains, and while guiding more than 140 trips to six continents, we have been truly fortunate to share unforgettable adventures with our clients and to make photographs in myriad sensational settings. Vertical Perspectives Photography is a continuation, as well as an evolutionary refocusing, of our lifelong devotion to sharing the mountains with others. Our passion for photographing climbers and mountains has paralleled but, until recently, taken a back seat to our careers as professional mountain guides. Carrying a camera while guiding, we have documented countless mountain adventures, providing memories for our clients and photos for marketing our business, and we have sold our images to various publications. But, making climbing photographs as an active member of a climbing party demands primary attention be devoted to safety responsibilities, not photography. You simply can’t be thinking much about photography when someone’s life is literally in your hands! 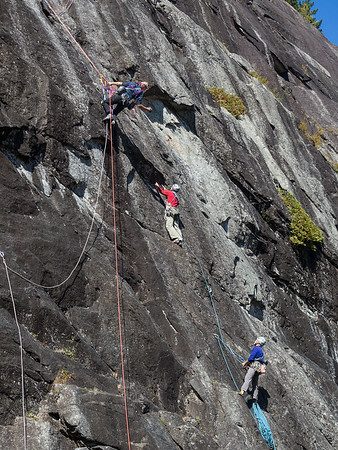 Although it is very possible to capture interesting photos as a member of a climbing party, and there are lots of good reasons to try, the scope of what’s possible is significantly limited. As a guide an even greater awareness is required, and it’s not optional. In recent years we have set aside much more time to photograph climbers, unencumbered by responsibility for their safety. Working with self-sufficient climbing parties, we are able to shoot from a variety of carefully chosen vantage points, to emphasize the most visually interesting aspects of a situation. Freed from climber safety concerns, we are able to position ourselves, and our cameras, in locations that would otherwise be impossible to explore. Often, we choose experienced, photogenic climbers to serve as models for our photo shoots. The resulting images could not be made while on the climb or from the ground. Some of the shooting positions we choose require extensive and complex rigging along with highly specialized equipment. Our decades of experience dealing with widely varying climbing situations, and our familiarity with numerous climbing areas, allows us to move ourselves, and our photography gear, around the vertical world with relative ease. Like mountain guiding, our photographic efforts arise from a desire to share the mountains with others. Unlike guiding, where we orchestrate, and take part in, an extended experience, photography is a purely visual medium which distills the essence of an experience by capturing just a single moment in time. When a photograph speaks with clarity, and evokes a deep connection to that moment, it becomes capable of transporting both photographer and viewer to a heightened level of awareness and appreciation. Sharing this enhanced perspective drives our artistic vision, and the efforts required to bring it to life. To speed up loading, and to discourage unauthorized use, most of the photographs on this web site have been downsized. In most cases this will not be apparent when viewed over the web. If you are viewing on a high quality, high-resolution monitor, especially if you zoom in, you may notice slightly decreased image quality. This is an intentional trade off. Our originals, and the prints we make from them, reveal everything that is lost by downsizing and displaying over the web.